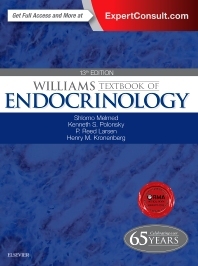 For more than 65 years, Williams Textbook of Endocrinology has been the gold standard in the field, delivering authoritative guidance on every aspect of adult and pediatric endocrine system disorders. The 13th Edition has been thoroughly updated by Drs. Shlomo Melmed, Kenneth S. Polonsky, P. Reed Larsen, and Henry M. Kronenberg, to bring you state-of-the-art coverage of diabetes, metabolic syndrome, obesity, thyroid disease, testicular disorders, and much more, all designed to help you provide optimal care to every patient. Bridging the gap between basic science and clinical information, it is an essential, relevant resource for endocrinologists, endocrine surgeons, gynecologists, internists, and pediatricians – any clinician who needs the most reliable coverage available on the diverse features across the spectrum of endocrine disease. Obtain a better understanding of both scientific insight and clinical data from the classic reference that delivers the current information you need in a highly illustrated, user-friendly format. Dr. Melmed co-edits Endocrinology: Basic and Clinical Principles, is the Neuroendocrine Section Editor for DeGroot and Jameson's Textbook of Endocrinology, and Williams Textbook of Endocrinology; and is pituitary section author for Harrison's Textbook of Medicine. In addition to being the Editor-in-Chief of Pituitary, he is on the editorial board of Journal of Clinical Investigation and past Editor-in-Chief of Endocrinology.